Just who in the world or who in the f*** (pardon the language) is Gaisorg who first appeared last week? Okay, I'm already thinking that the Dragon Quest battle theme needs to be played here with this guy. Gaisorg appears and he's harassing everyone. He's seeking for the strongest Super Sentai warriors to feed his bloodlust. I have to admit that it seems Koichi Sakamoto's fondness of explosions makes you wonder if he and Michael Bay are secretly working together. Gaisorg delivers a destructive blow which Akaninger blocks. Is Captain Marvelous always meant to be that jerk with a heart of gold type character who'd rather handle his problems on his own? Seems like it! 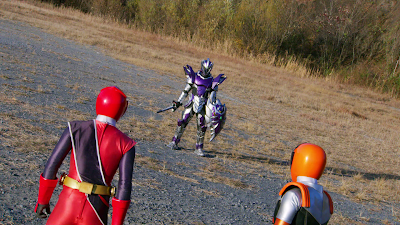 I like how Stinger arrives and tries to talk sense into Captain Marvelous. 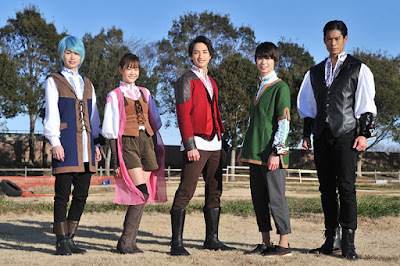 How Many Dragon Quest Games Have You Played Before Kishinryu Sentai Ryusoulger Will Air This March 17, 2019? 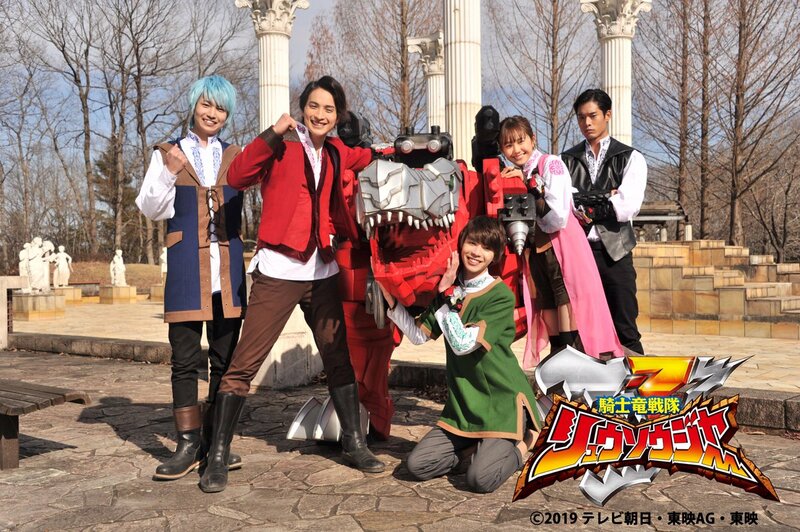 While the color-coding of Ryusoulger reminds me of Kyoryuger on the surface yet the attires feel like they were taken straight out of European people if you ask me! What goes into my head are some classic American and European fantasy films and literature that the Japanese ended up taking inspiration from for stuff like Dragon Quest and Final Fantasy. In my case, it does feel like Dragon Quest with the attires and the fact that Kishin means Fierce God and Ryu means dragon. The Super Sentai's English title should be Fierce Dragon God Taskforce Dragon Soul Ranger -- now try saying that all over and over again before you proceed to this next challenge! 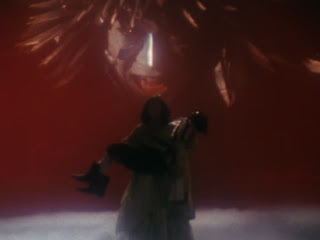 Zyuranger's 25th anniversary may be over but hearing that Dai Satan may be the last boss of Super Sentai Strongest Battle makes me want to remember all the nightmare fuel of Zyuranger. I don't deny that some of these footage was used in Mighty Morphin' -- I just want to write about the nightmare fuel that Zyuranger had really exceeded that of its localized version! Super Sentai continue to attack Gaisorg who wants to challenge & fight the Strongest One in the Universe. Meanwhile the true meaning of hosting Super Sentai Saikyo Battle comes to light gradually. Using the battle of Super Sentai, they were planning to revive Dai Satan in order to destroy the whole universe. The end of the Universe is getting near. Will Super Sentai be able to save the universe by bringing their Hearts of Justice, together? Super Sentai Strongest Battle Week 1: Who Is The Strongest In History? Well, I thought I would want to actually just summarize everything after four weeks for last since this is NOT a news blog. Instead, I decided to focus on the four-part series episodes on which would end the Heisei era of Super Sentai soon. If we're going to end it then let's end it with a BANG! We have Naruhisa Arakawa as the writer (though I'm afraid he's already hitting Burnout Ville soon) and Koichi Sakamoto (and maybe, secretly Michael Bay) as the head director of this mini-series. Now I advise you to get your Super Robot Wars vibes on first and maybe sing "Hagane No Messiah" or "Steel Messiah" before watching the show at your pace. Having it weekly gives me time to review it episode by episode in contrast to me marathoning old school Super Sentai series! I admit I have the stupid tendency to watch Super Sentai for the dumbest of reasons such as because there's that attractive heroine (and that happened that I decided to rewatch Super Sentai during the 2000s for that reason) -- I'm just glad that newer Super Sentai girls aren't that pleasing to my eyes anymore. I know, it was a dumb reason for me to temporarily skip Kyoryuger and ToQGer for Megafart (which had hotter girls but it's one stupid show) but again I thought about a couple of shows I watched even without an attractive heroine. 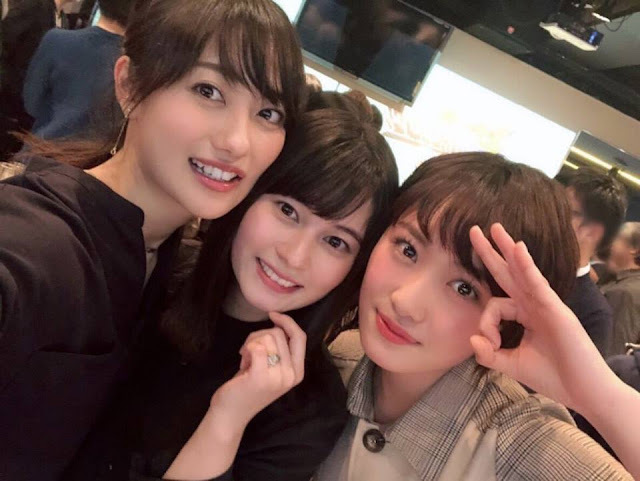 I did watch some Taiwanese series where the female protagonist wasn't really hot then the same can be true for Super Sentai. Bonjour and should I say adieu my friends! It's time for me to finally drop my pretending I'm a French guy act or is it? 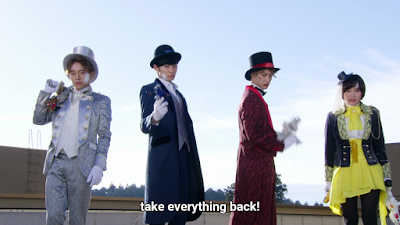 Well, there's still Lupin vs. Pat vs. Kyuranger (that's a MOUTHFUL) some time later -- which I may soon skip or not? Anyway, here's my thoughts on le finale of this series! Le final battle against Don Dogriano is that intense. He does seem invincible and le Patrangers are getting their butts kicked. But they aren't giving up so easily. I just love all the Michael Bay-ish explosions that accompanies Don Dogriano's final assault against humanity. 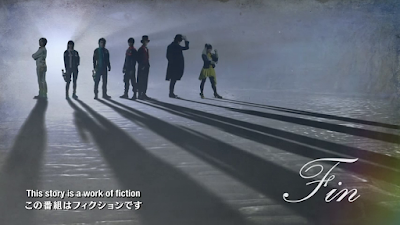 Meanwhile, le Lupinrangers are contemplating about their supposed demise. They are actually thinking that it would be their end. I can't blame them for being willing to end their lives. They may be phantom thieves but they have their honor. They could care less if they would live or die as long as the world is saved from le Ganglers. Excited? Nervous? I just finished my celebrity portion of the update in my East Asian Celebrities blog. Now it's time to focus on the storytelling part with my early impression of the characters and what to expect from them. Now it's time to try not to think about the cast members AND focus more on the upcoming main cast of characters based on what UkiyaSeed has to give. What's my thought on the character designs? They almost look like Dragon Quest characters! Granted, Akira Toriyama of Bird Studio is the man responsible behind Dragon Ball Z which was adapted by Toei into the Dragon Ball Anime series. I wonder is Toriyama involved in here or is Toei giving him a tribute with this series? I feel like an RPG is coming out. I even want to think it's like Kyoryuger (hopefully we won't get a Daigo Kiryu 2.0) married Knights of Tir Na Nog or Dragon Quest married Super Sentai -- at least on the surface! Bonjour my readers! Well I'm about to drop le Frenchman act anytime soon when this series is over! Now it's time for le second to le last episode of Lupinranger vs. Patranger. Le series wrapped up its filming last year -- now it's time to see le released material! Le start has le city battle. Ganglers are getting that aggressive as it's le final battle. Le Patrangers and Noel take care of le giant Pondermen pretty quickly. We also have Lupin Red fighting Zamigo. Meanwhile, both Umika and Touma escape le hospital. I wonder what was le elderly guy saying to them. Was he going to arrest them? Touma knocks him out before le two escape. This really has me wondering is it really becoming a trope for superheroes to ignore most of their injuries?